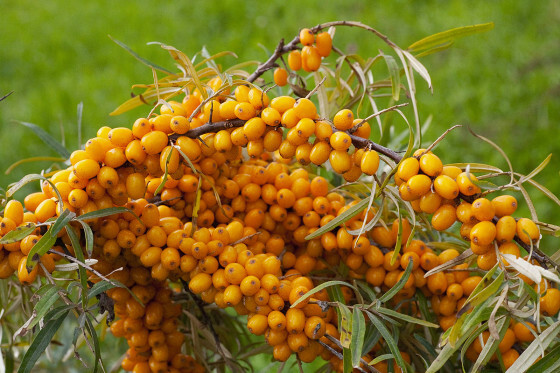 Why is sea buckthorn so valuable? First of all, sea buckthorn from Daila Kronberga’s farm "Dārzi" is grown in Latvia with the power from the soil of Zemgale and the energy of the sun. Sea buckthorn is a very valuable nutrient full of natural vitamins, because its leaves and berries contain practically all the vitamins existing in nature. The regular consumption of this fruit helps to augment the body’s vitamin reserves, strengthening the immune system and reducing inflammation. Sea buckthorn rejuvenates you! Unlike other juices, sea buckthorn is rich in both fat and water-soluble vitamins, as well as antioxidants that reduce the harm caused to the body by free radicals. It also contains vitamins C and E, as well as B group, PP and K vitamins and more than 180 biologically active substances. Sea buckthorn also has antioxidants that reduce the harm caused to the body by free radicals. For decades, sea buckthorn products have been recommended for use by people exposed to excessive radiation and sea buckthorn has also been used to improve the health of people receiving radiation therapy and to prevent tumours. Therefore sea buckthorn fruit is a source of energy, boosts immunity, stimulates the functioning and creativity of both body and mind, helps blood circulation, improves vision and stimulates cell regeneration. Sea buckthorn is recommended for use by athletes, students, people doing a lot of work and everybody who cares about a healthy lifestyle.